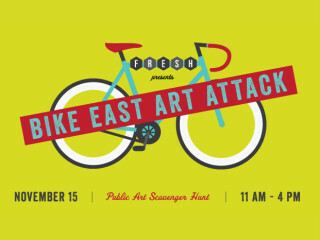 This public art scavenger hunt during the East Austin Studio Tour is the perfect chance to hop on your bike and win sweet prizes (including a new bike from Cycleast). Participants will receive a list of checkpoints at the beginning of the day. The more public art checkpoints you visit, the more chances you have to win. All participants will earn swag bags, free tickets to the FRESH Festival and are invited to the end-of-the-day party. A portion of proceeds from the event go to The Ghisallo Foundation, a local non-profit organization dedicated to educating youth in cycling. RSVP now to reserve your spot in the scavenger hunt.